Dave Williams is a fantastic musician, specializing in magical trumpet playing, also hosts Excursions: A Sight & Sound Festival. The event has music, poetry, and poetry with music! 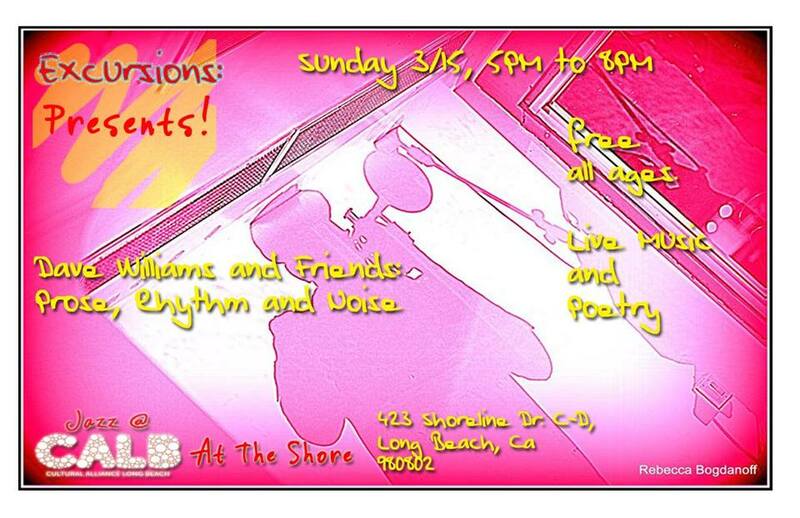 I am excited to be invited to participate reading poetry on Sunday, March 15th, from 5-8 pm, at CALB at the Shore located above Shenanigans Irish Pub in Shoreline Village. Even more excited to be joining two of my favorite Long Beach poets and friends, Shy But Flyy and Keayva Mitchell. Check out more details on the Facebook event page!